Being a bit of a beauty addict, I've tried many different brands in my quest to look good and feel my best. It's the eternal desire to be beautiful and stay youthful that keeps us searching I guess but recently, I've become rather taken with one brand in particular. 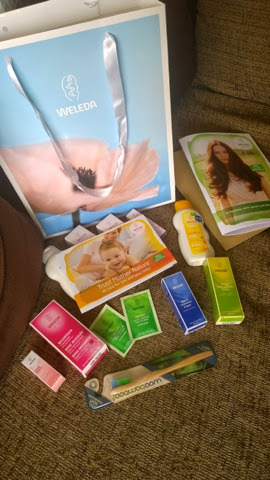 I first started using Weleda products this time last year, when Ethan was still a little bundle of newborn joy and I was looking for the kindest products to use on his delicate skin. I fell in love with their Calendula range (as you can read here) and then later down the line, their teething granules proved to be a bit of a saviour (see this post for more details). It wasn't long before I started exploring their product range further, reading review after rave review for products such as their best-selling Skin Food. Jessica Alba, Alexa Chung and even Mr Vanity himself, Simon Cowell, are all famous fans of this range and the more I learn, the more I realise why that is. 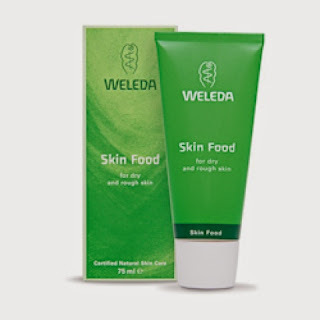 You see, Weleda products are 100% natural, contain active plant ingredients grown in biodynamic gardens that are blended with skin loving oils to great effect. 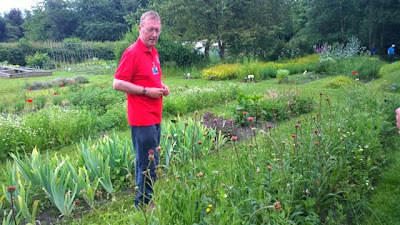 For almost 100 years, the ethos of 'working in harmony with nature and the human being' holds true and last week, I had the pleasure of seeing how such miraculous plants and flowers are grown to make the most wonderful natural skincare products. Every year, Weleda hosts a series of insight days in early summer and when I was invited to go along to one, I jumped at the chance. In good company with Mother and Baby magazine, researchers and midwives, I arrived at Weleda HQ in Ilkeston, Derbyshire, ready to find out more about natural beauty. From the last blogger meet up I co-organised, I knew quite a bit about the company and the saying 'what goes on you goes in you' has really stuck in my mind. The average woman puts 515 different chemicals on her skin each day which is quite a shocking figure to hear and one that has made me reconsider what I am using to cleanse and care for my own skin. The insight day kicked off with a welcome talk from the MD Jayn, where we were given a brief overview of the company, the products they make and the guidelines they work to. We learnt quite a lot about the company and its products - for instance, did you know that the recipe for Skin Food hasn't changed since 1925? We then boarded a minibus to go and visit the gardens where many of the plants used in the products are cultivated and grown, just a short distance away. Michael, who was head gardener for 30 years, was our guide and he took great pleasure in walking us round the gardens to see where many all the plants, flowers and herbs used in Weleda's products are sourced from. Each plant had a picture close by depicting what it was a core ingredient in and Michael explained what it meant to be a biodynamic garden and how they care for and harvest the plants according to the pattern of the moon and planets. It really was a fascinating talk, one which really opened up our eyes to the power of nature, and we all eagerly listened to the details given about the properties of each plant. 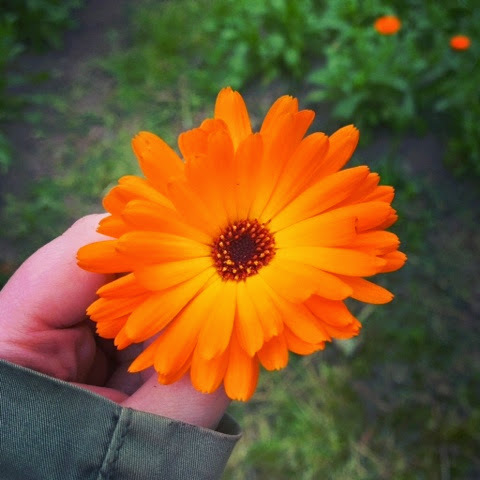 We then visited the area where Weleda grows the beautiful Calendula flowers which are used in the baby range of products. This flower really is packed full of fantastic qualities plus it's extremely vibrant and pretty to look at. We then headed over to see current head gardener, Claire, who explained how the goodness of the flowers is captured and preserved to make the end products. Essentially, the plant in question is chopped up into small pieces then using a top secret formula, ethanol is added to make a tincture, which is left to develop for a set period of time - in the case of calendula, around two weeks. The remaining liquid after this time is then used in the production of various lotions and potions. It had been a fascinating morning and my head was buzzing with new information as we returned to HQ for lunch. I met Evelyn Liddell, who works on new product development, and we chatted about natural skincare and its many benefits. She was a fascinating lady and having used Weleda products in the main since 2001, she looked amazing! 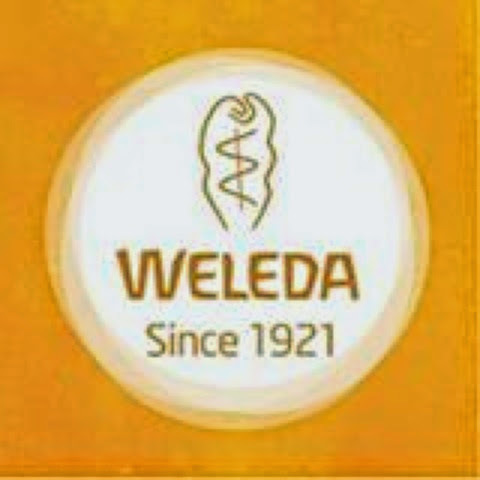 Next, Weleda had invited Sharon Trotter, a midwife and expert on mother and baby skincare, to talk to us on this subject after which we heard about all the new products Weleda has launched over the past few months plus a top secret launch - watch this space, all will be revealed here on 4th July! 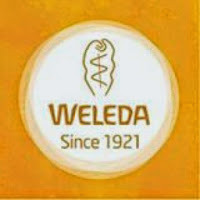 It had been a really informative day and I enjoyed learning about the theories and practices at Weleda. Their product range is impressive and the regular awards and accolades their products receive are testament to the care and attention that goes into making natural skincare solutions that work.